Despite my attempts to resist, the HP Microserver (with £100 cashback) was too tempting a deal, and I've recently taken ownership of a small server, Remote Access Card (RAC) for ILO functionality and 2 x 4GB memory sticks. The Microserver comes with 4 internal SATA drive bays. Disks are mounted in the brackets and then slide into the server vertically. There is another drive bay on top for an optional optical (DVD) drive. A USB port on the motherboard can be used for installing a hypervisor like VMware ESXi. My plan was to put 4 SATA disks into the internal bays and mount the SSD in the "ODD" (Optical Disk Drive) bay which would be used as a cache. The SSD is an OCZ Vertex 2 and is a 2.5" sized drive (as most SSDs are). To fit into a 3.5" bay, an adapter is provided. Another adapter was then required to fit the 3.5" bracket into the 5.25" bay. The Microserver has six SATA ports. The four internal drives are connected to the Microserver's mainboard via a "MiniSAS" connector. The remaining two ports are configured as the internal optical port and an external eSATA port. Unfortunately, the ODD SATA port and the external eSATA port are configured in "IDE Emulation" mode instead of the faster AHCI mode. This means that it will be limited to a maximum bus speed of 132MB/sec, significantly less than the 3Gbps that SATA can theoretically handle, and you lose some advanced features such as Native Command Queuing (NCQ). It's obviously not ideal to take your fastest disk and put it on the slowest port! Image courtesy of the excellent Techhead Microserver review and used with permission. A fix appears to exist, courtesy of a Russian hacker, who has patched the Microserver BIOS to enable an option that allows the user to turn off IDE Emulation mode and change the port mode to standard SATA. Important: This worked for me. Apply at your own risk. I'm not responsible if this bricks your server! You probably won't be covered under warranty if you have problems. Download the latest HP Systems ROMPaq Firmware Upgrade. (it doesn't matter what release you download as the modified BIOS will replace the version with its own). To get started, open the start.htm file in the download and follow the instructions on writing the upgrade to a USB key. Download the modified BIOS. You can get a copy of it here. Once the USB keyhas been written, replace the *.ROM file with the modified BIOS, renaming it so that the original filename remains. The provided ROM on my system was called O41040211.ROM and the modified ROM was called O41_AHCI.ROM. I removed the O41040211.ROM and renamed O41_AHCI.ROM to O41040211.ROM. Insert the USB drive in the Microserver and boot it. The firmware should apply. Once this returns the C:\ prompt, remove the USB drive and reboot. Enter the BIOS when prompted to press F10. 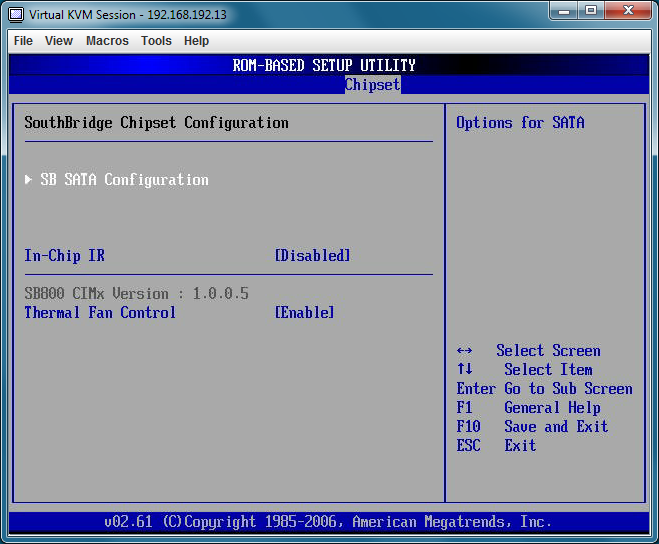 All SATA ports are now running at the optimal AHCI mode allowing for up to six disks to be connected at full speed and with no legacy overhead. 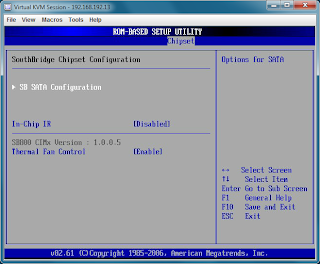 I've got esxi 5 installed and have several vm's running there. Its small, silent and low power consuming. I'm very happy i bought it. Sata ID Combined Mode [Disabled]. SATA ESP [Enabled]. SATA Power on all PORT [Enabled].